The Dallas County Fair continues tomorrow at the fairgrounds in Adel, and it’s the 4-H Clover Kids Day. Another activity specifically for kids is the annual “Amazing Public Health Race,” sponsored by Dallas County Public Health. Participants can stop by the gazebo at 10 a.m. and take part in a free scavenger hunt/race activity that will take them throughout the fairgrounds. Other activities include: pay-to-play video games; Little Critter Corner; the Pork Chop Revue comedy show; a balloon artist and pony rides; the “Ninja Experience”; and various shows and exhibits. The day will wrap up with the Junior Rodeo and Mutton Busting event at 7 p.m. in the South Arena. The Raccoon Valley Radio Big Red Radio will also be at the Dallas County Fair tomorrow and each day through Sunday. We will broadcast live, play music by the gazebo, and provide public address announcements. Be sure to listen to Raccoon Valley Radio throughout the week for results and updates from the fair. 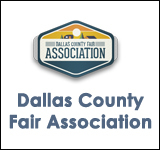 You can also find results under the Dallas County Fair tab on this website. To see a full list of activities for today and the rest of the week, click the link below.